Harrier of the month nominations:	Anna Pickering for the Stoop; Nathan Edmondson for comiing in 5th at the Stoop, 8th at Chevin Chase; Jack Wood for Mysercough 10m win, WYXC and 4th at Chevin Chase; Pauline Munro for being 1st FV45 in WYXC series, 3rd lady at Chevin Chase, also Stoop and Auld Lang Sang performances. The winner is Pauline Munro. The winner is Natalie York. From Jane McCarthy ... The 2017 Harriers League is now complete following the final races of the year. Petra Bijsterveld has been kind enough to independently verify the results. It is great to see that 30 Harriers did 4 or more League races in 2017, with the best average points per race being Tom Adams with 605 pts from 6 races. The Top 5 placed runners in the Overall League scored in their maximum of 10 races (3 counting from each category and a nominated wildcard race). Well Done to Jane McCarthy, Alison Weston, Dave Robson, Michael Duffield and Peter Lewis. There were some super performances in the final few races - including ... Jack Cummings, Tim Ashelford, Ben Sheppard, Michael Lomas and Jonathan Turner at Burley Moor Run; Hilda Coulsey, Steve Gott, Martin Archer at PECO(1); Caroline Howe at Guy Fawkes; Alison Weston, Jack Wood and Michael Lomas at the Full Tour of Pendle; Hilda Coulsey at the Yorkshire 10 mile and Jack Cummings securing his Fell Category win at The Stoop in December with a 10th place finish. If there are any queries with the Race League please contact me at janemccarthy@me.com ASAP. The Top 10 finishers in the Overall League all receive prizes at the Annual Awards Do on Friday 19th January. See you there! Good Luck with and ENJOY racing in the 2018 Harriers League. From Petra Bijsterveld ... Ribble Valley is always quite the antidote to the festive season, out with the fancy dress and turkey hats and back to the grindstone with some serious road racing, though surrounded by a beautiful landscape. This year the race included the North of England 10K championships and thus attracted an elite field with the first 50 runners arriving home inside 34 minutes, despite conditions being a little windy. The photos from the lead car show a tight race at the front end with Jonny Brownlee coming second to 2016 winner Marc Scott, third was Barnet's Richard Horton, still sub 30 minutes. First woman was Morpeth's Laura Weightman in 32:31. 13 Harriers lined up and new member Ian Fothergill led the Ilkley team home in an impressive 37:13. There were excellent efforts and from all and Sally Malir was 1st in her age category. From Petra Bijsterveld ... Many parkruns in the area were cancelled today due to remaining icy patches on paths. I went to Roundhay where the 'winter course' on Soldiers Field was in operation. It was very runnable in a XC kind of way with lots of standing icy water and semi-frozen mud. Good fun despite already having lost the feeling in both feet during my 'warm-up'! 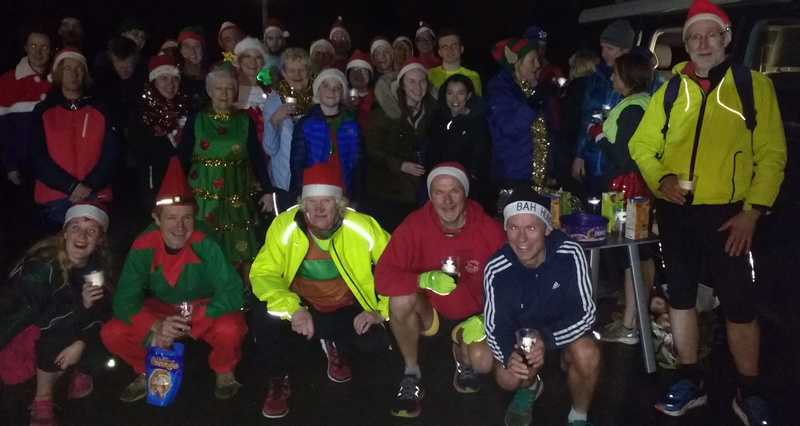 From Vince Gibbons ... Eleven teams turned out in festive spirits and fancy dress for runs, mince pies and mulled wine, followed by a quiz at ILTSC. Thanks to all for making it a highly enjoyable evening of frivolity. Postscript: The IH Christmas Relays and Quiz were a great success with nearly 70 people attending. The club raised a total of �104 which will be donated to the Upper Wharfedale Fell Rescue organization. Thank you to all who attended and donated. From Tom Worboys, Jane Bryant, Jo-Ann Pattinson, Lucy Williamson, Rob Cunningham, David Howe, Steve Newell, Sally Lynch and with 3 places allocated the following were drawn; Tom Worboys, Rob Cunningham and Jo-Ann Pattinson, with Steve Newell and David Howe in reserve. Good luck to those picked out, commiserations to the others. From Hilda Coulsey ... It was great to see so many out for this Predictor run in memory of Brian Sweet, a long time stalwart of the club. His widow, Joyce started us off and encouraged us on the route. Thank you to Natalie and Bernie for organising this and others on the route. The closest to their predicted time was Peter Roll, with Petra Bijsterveld second. A prize will also go to this year's beginners, Jo Pattinson, Claire Greenwood and Liz Snell who came in together very close to predicted. The prizes will be presented at the quiz on 19th. From Vince Gibbons ... The inaugural Brian Sweet Predictor Run was a fitting tribute to a loyal stalwart of Ilkley Harriers for over thirty years. Harriers turned out in good numbers to remember Brian, who led a club night run every week for decades. He overcame cancer twice and continued running until his 80th birthday. He was particularly welcoming to those new to the sport, always encouraging them to keep going. Many thanks to the organisers. From Natalie York ... Results. Second column shows difference from predicted time.